Bring divine harmony to any room with this beautiful globe shaped salt crystal lamp. Its fiery glow produces the image of an ignited fire place and its orange hues infuse a natural calm bringing the mind and body to a gradual sense of tranquility and well being. 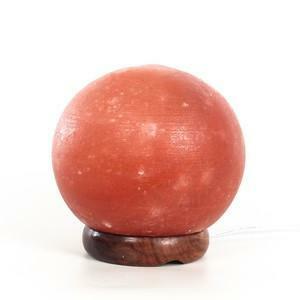 The Globe Salt Lamp is a negative ion generator. These spherical natural salt crystal lamps can create a cleaner, fresher quality air, reducing airborne pollution, smoke and dust. Himalayan Natural Salt has its history deeply tucked away in the Himalayan Mountains. Like the age of the mountains, so is the birth of this crystal salt. It was formed after the primeval sea dried up over 250 million years ago. Born in an immaculate environment, free of all pollution, this salt remains perfectly crystallized. Sphere Salt Lamp embraces both beauty and function. The soft light bathes any room in ambience, surrounding your space with positive energy. The spherical shape enhances the connection between you and the universe… Complete with a cord, you are already on your way to plugging into this natural source.